I won’t soon forget the memorable dinner I enjoyed with the Chicago Supper Club. Everything from the concept and passion of the chef down to the execution of the dishes created excitement in me for sharing with others this unique dining experience. 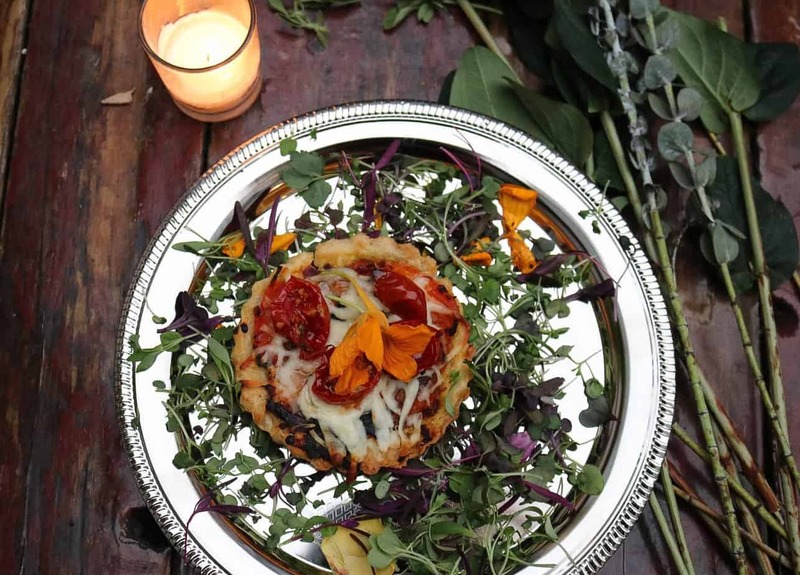 Chicago Supper club is a farm-to-table pop-up dinner party that celebrates local farmers and small businesses of the Midwest. Chef and owner Samantha DeMichael, a Chicago native, is passionate about befriending farmers and educating others on the source of their foods and knowing what’s on their plate. She started the farm to table dining experience in December 2017 after working at local farms and markets for the past four years. Chef DeMichael adheres to a Paleo lifestyle which emphasizes healthy living by avoiding processed foods, refined sugars, gluten, and dairy; although she did state that she’s flexible on the dairy as long as she knows the source of the milk and cheese (Yes, Cheese FOREVER!!!!). Each dinner course except for desserts is created around the paleo lifestyle. The Supper Club meets twice a month at secret locations throughout the Chicagoland area. My dinner was at Homestead on the roof, a lovely space! So many pretty details were arranged on the table. I was able to enjoy the dinner along with 15 other beautiful blogger babes. The evening began with flowing wine and conversation. The setup and information provided prior to the dinner had me eagerly looking forward to the courses to follow. The vegetables and hummus were a nice start. I gotta say that….the sweet pea hummus was incredible. I never knew that I could savor sweet peas so much! Great produce from these two farms! Growing Home’s farms are the first and only USDA-certified organic high-production urban farms in Chicago. Their .87 acres of farms are located in Chicago’s Englewood neighborhood; they service areas within a 20-mile radius. Growing Home Farms are doing great things for the Englewood community; be sure to check out their website! Mick Klug farm located in St. Joseph, Michigan focuses on providing sustainably farmed, hand-harvested, quality fresh fruit and vegetables. This tomato tart was sensational! Let me tell you if you’ve never tried a Mighty Vine Tomato; YOU ARE MISSING OUT! I’ve been a crazy tomato fanatic all my life and all tomatoes aren’t created equal. I eat Mighty Vine’s tomatoes like candy! Mighty Vine’s tomatoes are sustainably grown in the Chicagoland area and picked and at local markets within hours. You can surely taste the difference. They’re so sweet! Although I’m not much of a rhubarb fan, I have to admit that this strawberry & rhubarb compote was quite tasty with the cake. There was one extra piece of cake, and I happily accepted and split it with the person sitting next to me. I could’ve eaten it all by myself though. The evening and dinner were fantastic and a reminder to me to be more mindful of what I put on my plate and in my mouth. We often fall into a habit of convenience when eating, and I know at least personally that I need to do better. Either I had no idea, or I’ve never paid attention to the urban farms located within the city of Chicago. There are many healthy local options here. I was very impressed as I walked away from this dinner. “Support local, know your farmers, and where your food is coming from. It’s very important, and it tastes better. Many will argue that healthy eating is too expensive, but maybe we should start asking why things are so cheap! The thing is it isn’t that expensive….it’s very affordable. Sustainability is the new black. It’s here, important and what we need to focus on! Well said, I certainly have taken notice! Be sure to check out the Chicago Supper Club website to purchase tickets for the next pop-up dinner party. Chef DeMichael also does private events.